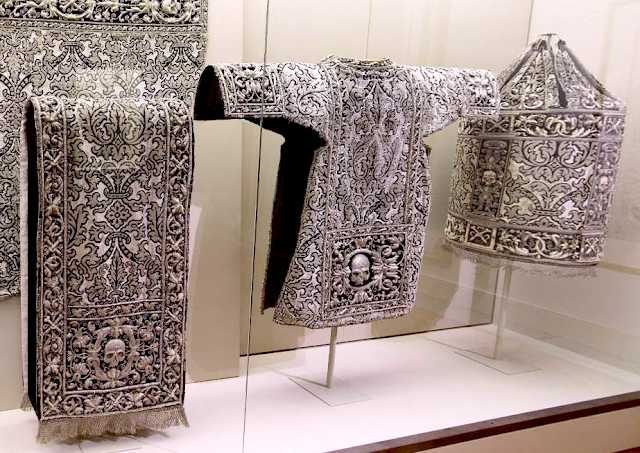 A set of vestments came to my attention by way of LAJ's clerical dress forum that begged for more attention as an article here on the main site -- being an exquisite work of craftsmanship. 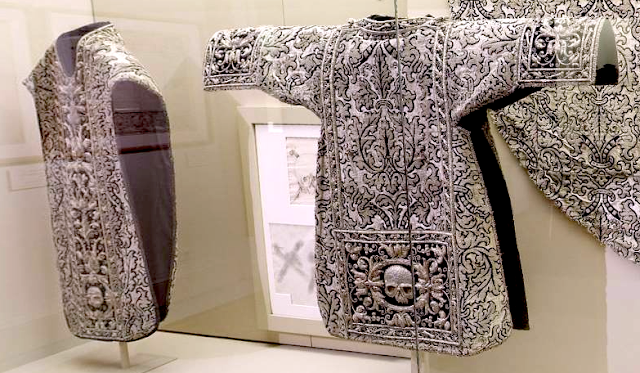 Admittedly the word "exquisite" can be all too easily tossed around at times, but if there is something that is worthy of that description this vestment set surely finds its place amongst them. 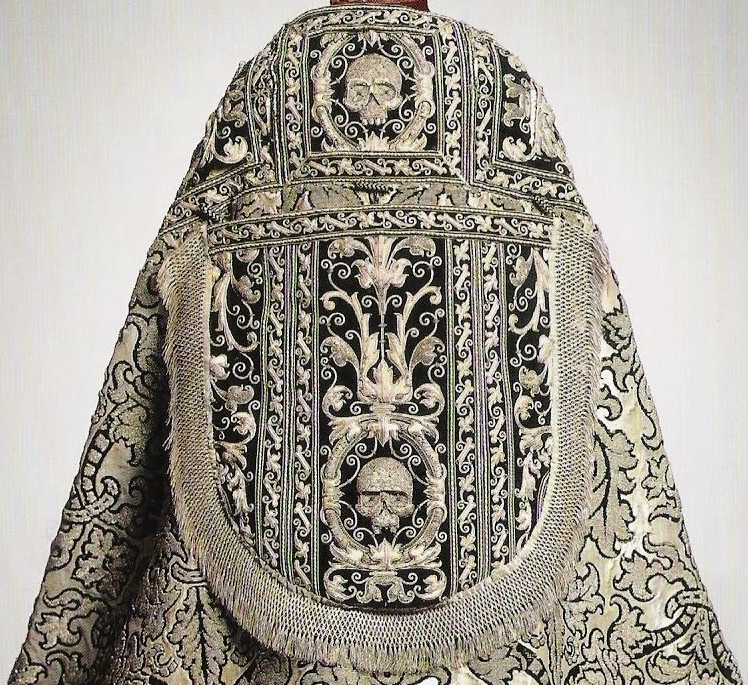 The vestments in question are a black Solemn Mass set -- which is to say that it includes chasuble, cope, dalmatic, tunicle and so on -- that come from the Royal Monastery of San Lorenzo de El Escorial in Madrid, Spain, crafted in the royal workshops of El Escorial between 1569 and 1600. 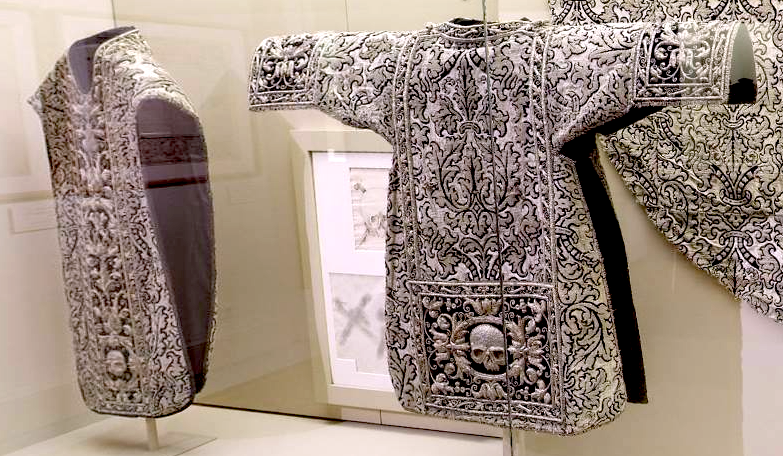 The set is noteworthy for its fine silver embroidery which prominently employs skull and cross-bones symbolism throughout. Let's take a look, beginning with the cope. A view of the cope 'laid out' which allows for a better view of the broad orphrey. A closer look at the orphrey. This is what would, of course, appear on the front of the chasuble when worn. A detail that could be easily missed are the cross-bones set in the middle. 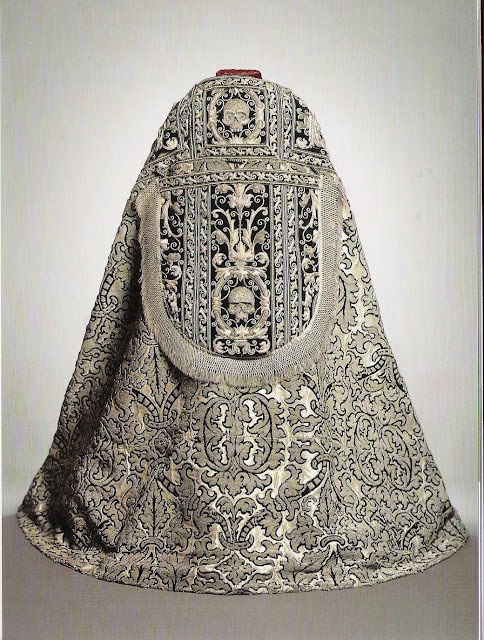 Unfortunately this is the best view of the chasuble that I have available, however it is fairly easy to envision based on the other pieces. 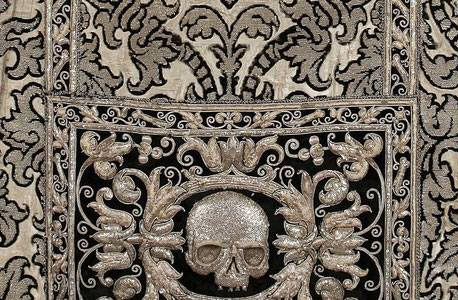 It is also worth taking a more detailed look at the embroideries, most particularly the images of the skull. The skulls are particularly impressive for, as you can see, they are done in such a way that they have a three dimensional quality to them -- a quality further brought out by the play of light and shadows upon them. Extraordinarily fine work here. Surrounding them is further embroidery work, also impressively textured and adding further visual interest. 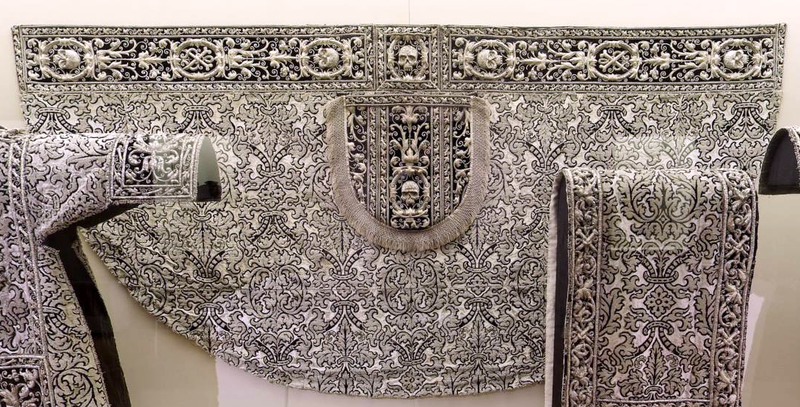 This particular closeup also gives a better view of the black and silver brocade which has its own textural quality. You can see that there are various silver tones, some of which are much more grey. This has the effect of not only providing more visual interest to the vestments, but also darkening them so that it does not appear white. A truly impressive set worthy of royalty -- but more importantly, worthy of the sacred liturgy and divine worship.